damn! this is it... 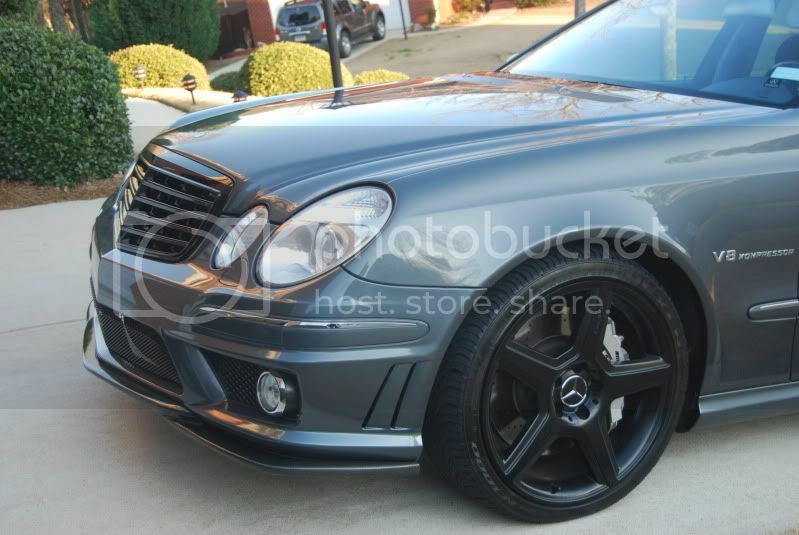 Car, color and front bumper I want! Some decent pics. In some of them...the car is in off road mode (lifted) because I'd been out and about...speed bumps are NOT my friend. I rinsed it off and went to Home Depot...and got two "nice car man"'s. (one at car wash...one at home depot). All w/o PDC shipped today. So i noticed through the lower front center grill you can see the ground, what is with that? Also, the front passenger headlights deffinetly have a larger gap on the grill side as opposed to the drivers headlights. Last edited by emoving; 01-21-2012 at 12:37 PM. 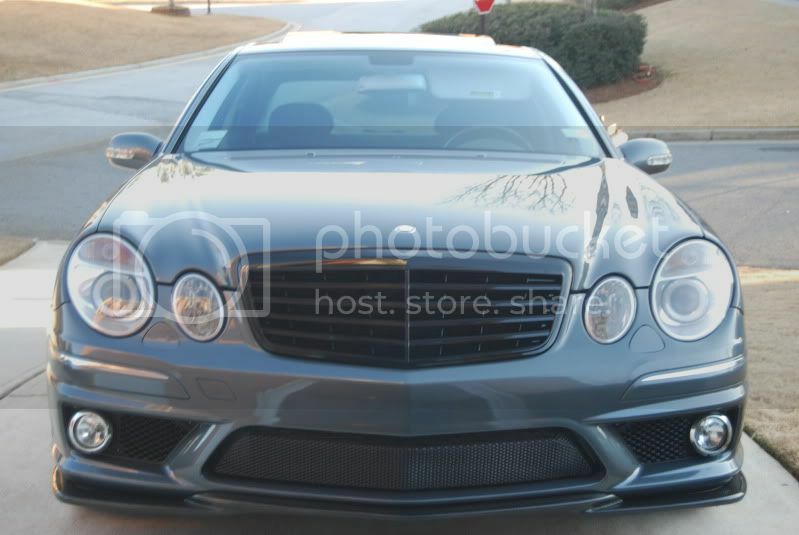 The gap is what happens when you dont buy the new e63 front tray cover. it leaves a gap. Ahhhhhh, I couldnt deal with that. Looks cheap. How much is the tray? i thought we can reuse the e55 tray? Apparently you can if you want to see the ground through your mesh grill......like a Dodge Neon. Looking good, like the color. Not the typical boring W211 color. It fits. Reminder, on the stock E55 bumper , the front tray slips over the top of the bottom-no attachment up front. On the E63 bumper, the tray length is fine, it's that the gap is in height. The E63 bumper also has foam reinforcement pieces that should be bonded to the bottom (might be missing from a few cars pictured here). The tray front sits on top of these. 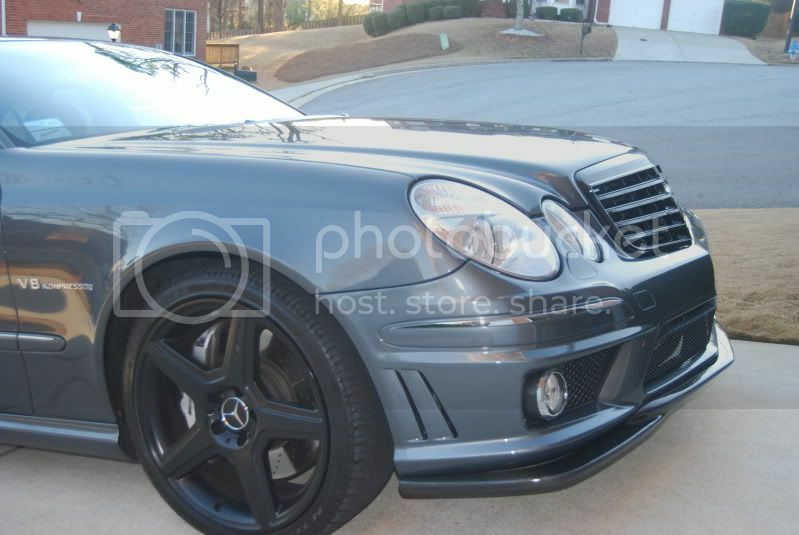 So yes there is a gap, but not in length, the E63 bumper sits lower and with those foam pieces the gap widens a tad. It is still very secure and nothing is dangling, at least should not be. Tough to tell, but it appears by the pics that the bumper might not have the foam pieces. These are bonded (urethane/epoxy) to the bumper. Last edited by pearlpower; 01-22-2012 at 01:09 PM. I will be going to the body shop later this week so if any of you want more specific close-ups pre-install of the product let me know before it goes. This is the box that was delivered. Was shipped last Thursday and I got it Wednesday of the following week, CA to FL. The box is odd shaped and huge, but it is super light! Lighter than a gallon of water, imho. There's a sheet of plastic covering the whole bumper, and inside, the bumper is wrapped in bubble wrap. For those of you wanting to put LEDs or different colored fog bulbs, the kit comes with these installed... just so you know what size to buy, it is a H7. 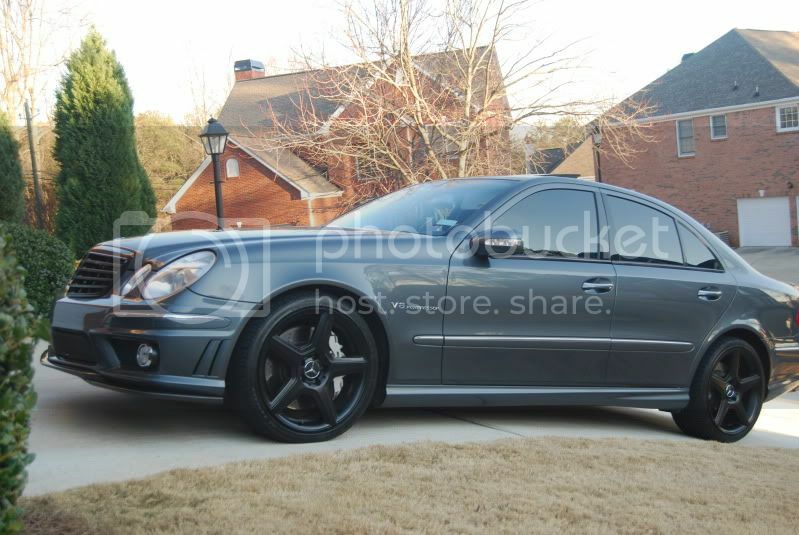 Can't wait for my body shop appointment to get this puppy painted and installed! Last edited by DaytonaJae; 01-25-2012 at 01:28 PM. Fog light & grille, along with chrome strip, all included by Suvneer, installed perfectly. Clips that hold in the front grille were also supplied by Suvneer in the kit. The bumper support (black plastic piece) and the energy absorbers (foam blocks) transferred from my original bumper. The shop had to trim some pieces to fit the E63 bumper, as you can see by around the side vents due to the shape difference of the two bumpers. I didn't get to see it on the car yet but I asked them how the fit was for an aftermarket bumper like this. He told me that he was very surprised that the fit was so perfect, and that most aftermarket bumpers that he comes across are "incredibly rough" and need a lot of work to fit & finish correctly. He concluded by saying that this "is probably the highest quality aftermarket bumper he has seen". This made me extremely happy! 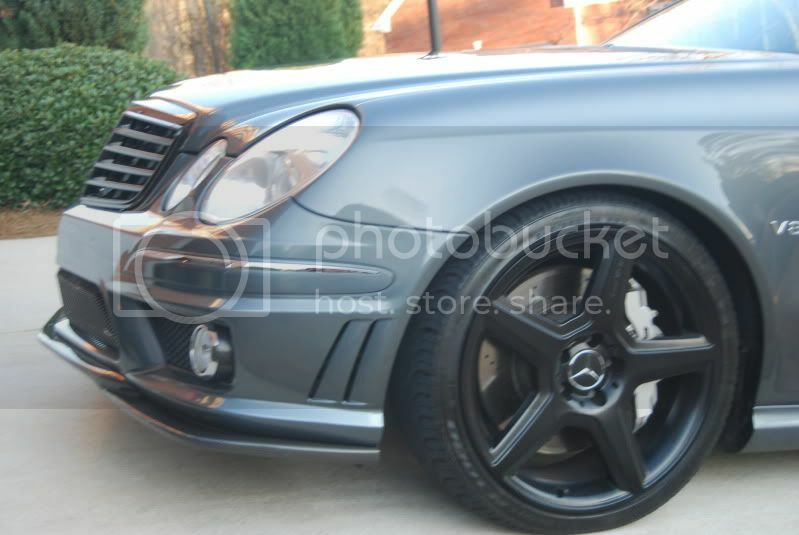 I pick up the car later today, will post pics of the finished job here. That looks so clean in white! Are those the original headlights? The headlights are original, part of the Premium 2 package (HID projector lights and keyless go). 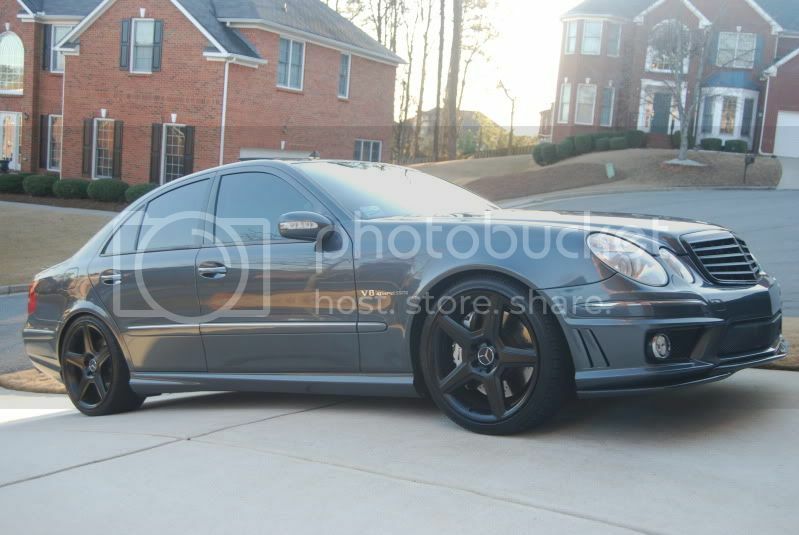 Car is a 07 E350 Sport with P2 package. So the grille is already facelifted and fits this bumper. Looks great ! And thank you for sharing the info. Did you buy any mounting accessories or your bodyshop just did everything for you ? You don't actually need the side skirt, just lower it with 20" Looking HOT ! His side skirt is white so match pretty good. Its a nice upgrade for exterior look. Did you buy any mounting accessories or your bodyshop just did everything for you ?